It’s absolutely beautiful! Came packaged nicely and with a very sweet note from the shop! I’m so excited to wear it. The colours were perfect - exactly as ordered, and the robes are very well made. 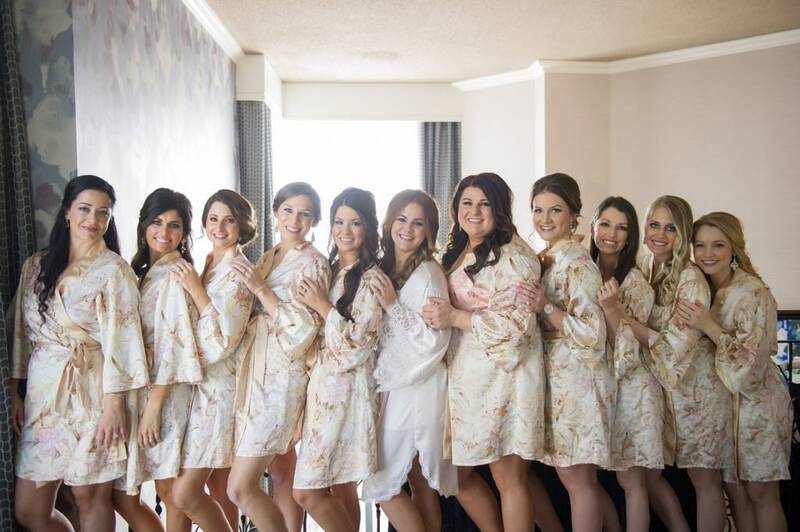 I can't wait to see my bridesmaids in them! Custom&Personalized orders definition : customize the robe in various trim+lining drape color from drop down list, customization will only be done in not-average proportion e.g. thin frame but very tall, thick frame but short, maternity, plus size, extra long(selected from drop down list+take note) If above information isn't provided, selected size will be as in transaction regarding our size chart for relax/ loose fit & above knee length from 34-36" from major preferences for wedding. We do not customize individually if the proportion is in normal size range and height is less than 5'9" (eventhough not in the same height) If different length needed, exact length (not height) "inch" should be clearly stated in the note. 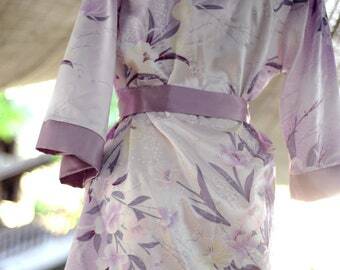 Particularly for Satin robe : due to being folded for shipment, the robe might need warm (low heat) QUICK ironing for nicer look (steam ironing should be avoided) Ironing the inside is better than the outside of the robe. Delicate machine-wash or handwash with mild shampoo is recommended. Please do not wring or sqeeze, leave it air dry or put in dryer with very low heat as shown in care symbol of our brand loop for inner tie as satin is a delicate fabric that should be handled with care, even just a scratch can have some flaw. Please, note that solid burgundy lining drape/ trim is non-color fast, please wash separately. However the color will not be absorbed. What should I do if there's some flaw/ not as described ? If you're not happy with your purchase regarding flaws, or not as described color shade please let me know within 3 days of receiving items. This doesn't include the size change if as ordered. *** (Photos or evidence of products issue should be provided for replacement/ partial refund exclude shipping fee)*** Partial refund will be considered upon the degree of flaws 5%-10% case by case. Please note that satin fabric should be handled with care, even just a scratch can have some flaw. Regarding color shade, there's no way that the color will be exactly 100% accurate. As we all know that the color can be affected by many factors. Even seeing in person, the color changed due to reflective angle of the light, lighting conditions. How long will I receive ? expected delivery ? Turn around time (overall) : 1-2 month [7-21 d(processing)+20-30 d (shipping) . Shipping turn around time counted after the date "scheduled to be dispatched by" in Etsy transaction. e.g. if order placed on 1 May, Scheduled to be dispatched by 18 May (D1-18 are for processing) then ship out the latest 18 May+average shipping time (20-30 d). So your order will be delivered around 18 Jun latest. In other words, Overall turn around time will be more than 1 month. However we always ship as soon as finished, most of the time earlier than scheduled. Therefore we really advise to plan in advance >2 month, as every robes are made to order, we don't stock at all- just in case of any issues / concern so that could be solved in timely manner. Can I change size / order after transaction made ? Regarding the drop down list to select, there's the lining drape color. To clarify "lining drape" is the "front trim" of fabric which can be solid, pattern/ floral. But if the trimmed sleeve needed, please select "plus trim". If not selected, then your order will only have front trim. Please note that the color of the lining drape/trim is the same as the sash belt.